Adam Lippes cocktail dress with lace trim. Sheer lace inset at back. Made in the USA of Italian material. A graduate of Cornell University, Adam Lippes began his career in fashion at Polo Ralph Lauren before moving to Oscar de la Renta, where he became one of the youngest creative directors in the luxury fashion world. In 2013, the Adam Lippes brand was created, a collection of luxury sportswear anchored in classic elegance, refined fabrics and impeccable tailoring. Launched to critical acclaim, the collection became available at the finest retail partners beginning with the Fall 2013 season. For in-store inquiries, use sku #2090560. Halston Heritage bonded crepe dress. Approx. length: 30"L down center front, 31"L down center back. Jewel neckline; back center cutout. Sleeveless; cut-in shoulder coverage. 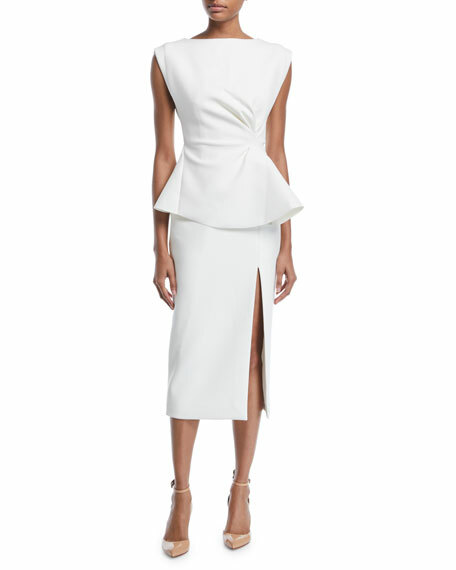 Fitted silhouette; asymmetric peplum. Straight hem. Hidden back zip. Polyester/rayon/spandex; lining, polyester. Dry clean. Imported. 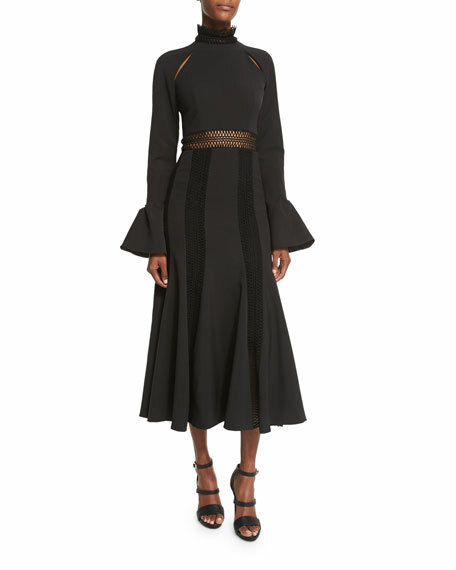 Jonathan Simkhai dress with soutache trim at mock neckline, waist, and skirt. Long trumpet sleeves; cutout details at shoulders. Princess seams at bodice. A-line skirt; flounce hem. Hidden back zip. Acetate/polyester. Trim, cotton. Imported. Rachel Gilbert dress in bonded twill. Bateau neckline; V neckline. Ruffled frills at back. Sleeveless; full shoulder coverage. Cinched waist with peplum. Ruched waist. Sheath silhouette. Hidden back zip. Front leg slit. Polyester/spandex. Imported.